1. Preheat the oven to 325ºF (160ºC) if making a loaf and 350°F (180°C) if making rolls. Lightly oil a 9-by-5-by-3-inch loaf pan or 12-cup muffin tin. 2. Toss the flours, baking soda, salt, and oats in a large bowl and mix well. 3. In a separate bowl, beat the eggs with the oil. If a sweeter, darker bread is desired, add the 2 tablespoons molasses. Gently stir the wet mixture into the dry mixture. Then gently stir in the buttermilk. The mixture may be sticky. 4. If making a single loaf, turn the batter into the prepared loaf pan and smooth the top with a wet spoon. Sprinkle some seeds or oats across the top, if desired, and then bake for 1 hour. After the hour has elapsed, remove the bread from the pan. If a crustier loaf of bread is desired, transfer the loaf to a baking sheet, return it to the oven, and bake for 20 minutes more. If making multiple rolls, spoon the mixture into the prepared muffin tin and bake for 15 to 25 minutes. 5. Allow the loaf or rolls to cool on a wire rack before serving. The brown soda bread is best when served with a schmear of butter, honey, preserves, or any combination thereof. It will keep at room temperature for up to 5 days and in the freezer for up to 3 months. Notes: lightly tap in the oats after you place them on top of the loaf batter evidently I didn’t “glue” them enough so that when I took the bread out of the pan I lost some of the crispy oats. No problem though since honey goes so well with brown bread, I drive a little over the loaf and put the escapees back on top of the bread for the final minutes of baking on the cookie sheet. Use a Nonstick pan if you have one as this pan was difficult to get out of the pan even though it was well oiled. 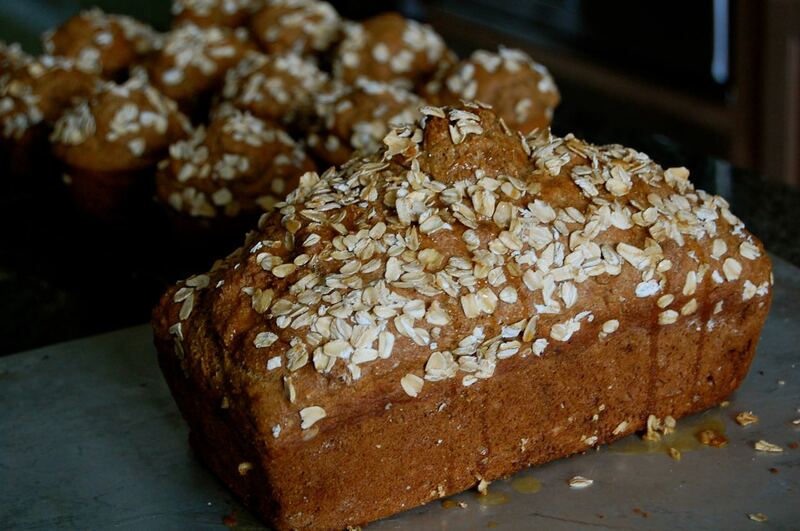 Brown Soda Bread Recipe © 2013 Kevin Dundon. Photo © 2013 Cristian Barnett. All rights reserved.